You are here: Home » Blog » Bulletin Board » 2018 Salmonberry Contest, Recap of 2017 event & Interview with our 2017 Guest Celebrity Judge Kirsten Dixon! There are quite a few things that come to mind when you think of summer in Seldovia, and one of the very special ones, is the fact that we are a haven for Salmonberries! We’re in our 2nd year of hosting the Salmonberry Dessert Contest, and we agreed that we needed to divide up the categories a bit as we had such a variety of treats last year! We will have two categories in our renamed “Salmonberry Delights Contest”! Sweet OR Savory – thanks to Kirsten Dixon for that description of last year’s event! This allows folks to submit both the “Sweet” Salmonberry Desserts as well as “Savory” Salmonberry Dressings, sauces & other. We’re excited to see what this year will bring! The audience loved when the judges began sharing of all the treats once they had judged their portion. This year we will have a People’s Choice winner as the crowd truly enjoyed getting in on the tasty fare! 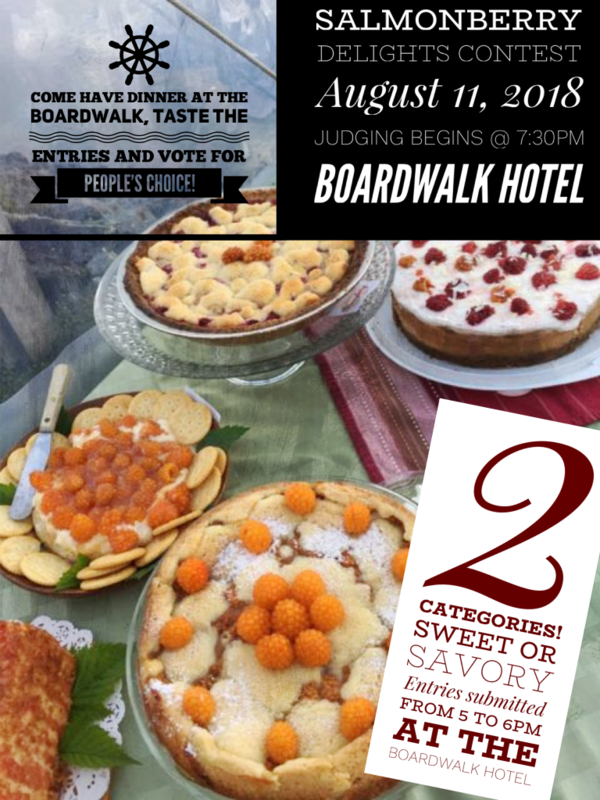 So, to all entrants, please have enough for the 3 judges as well as some to share tastes with the diners at the Boardwalk as they will each have one vote! This worked out beautifully last year, as the three judges just take a taste of a pie or cake so there is plenty to share… but when it is just a candy, scoop of ice cream or a muffin, there is not much to go around! So keep that in mind! Bring your entry before 6pm and sit down for dinner and a front row seat to the contest judging that begins at 7:30pm! I know many folks who don’t live in Seldovia can’t wait for the season and make trips to our side of the bay for these elusive fruits! Last year, as we looked back at our photos from 2016, we figured we would be safe to have our contest in late July! Not so! Our lack of sun and warmth last summer led to a mediocre and VERY late summer crop of salmonberries, so we moved the event to the end of August! Thankfully, it all worked out to the good, as Kirsten and Mandy Dixon were able to make the event in August, and never would have been able to swing it in July! This year, the berries are ripening and plentiful, if you can beat the crows! Last year, I wasn’t sure how it was going to go – if folks would find any berries – if anyone had great dessert recipes to create something for a contest… but when 7:30pm drew near, we had 25 entries! We had to bring out two more tables to manage the dessert feast! We had salmonberry coffee cake, salmonberry swirl cake, lemon salmonberry marscarpone cake, salmonberry cheesecake, brie cheese with salmonberry chutney, salmonberry cake with fireweed honey sauce, chocolate covered rice crispy salmonberry truffles, salmonberry shortcake, salmonberry crumble bars, salmonberry rhubarb pudding cake, salmonberry smoothie, salmonberry cheesecake bites, salmonberry sweet buns, salmonberry custard pie with shortbread crust, brie with salmonberry lemon cream cheese and salmonberry jelly sauce, angel food cake with orange butter salmonberry sauce, love of salmonberry pastry with cream rose salmonberry essence, etc! It was incredible! Thanks so much to Jeremiah and Angela and the Boardwalk Hotel staff who worked hard to accommodate all the entrants, people and fun! They did a phenomenal job! We look forward to having the contest there again this year! Thank you for hosting! Enjoy the Slide show from last year’s event below – where you can see the winning entries and amazing chefs and bakers of Seldovia! Get inspired! It was such a privilege to meet and host Kirsten and her daughter Mandy in Seldovia. Thanks so much to Valerie Granath from the Bridgekeeper’s Inn who offered her B&B for the two of them to enjoy a night in Seldovia after the contest! I had a chance to visit with Kirsten and wanted to share some of her thoughts after the event was through! Jenny - When you were invited to be a judge, what made you say “Yes”? Kirsten – I enjoy any opportunity to visit Seldovia. We’re such close neighbors! At Tutka Bay Lodge we just feel that we are part of the Seldovia community and of course, I’m a huge fan of salmonberries and I’m a huge fan of our wild edibles bringing people closer together. Jenny - You’ve been to Seldovia before, how was this visit? Kirsten - Every time we visit Seldovia, it’s always a little bit more vibrant and active than the time we were there before. People are super kind and friendly and very warm and inviting to us. Jenny - What was the highlight of your stay? Kirsten - It was a quick and short stay, but we were amazed at all the incredible baked goods submitted into the contest. So many talented cooks and bakers, both sweet and savory. Jenny - Was the contest what you expected? Why? Why not? Kirsten - No, it certainly wasn’t what we expected. The talent and variety of the entries along with so many people entries, over 25! It was pretty amazing! The food at the restaurant was incredible, the company was wonderful, the music was really beautiful, and overall the evening with such great fun. The bed and breakfast was sweet with such a lovely morning breakfast. Jenny - This was our first time hosting a contest like this. Next year, what could we do better? Kirsten - We had a last-minute impromptu plan to share the desserts with people who were at the restaurant. I think this is a really fun way to bring observers into the event. Next year perhaps, you can ask the participants to make one entry for the judges and one to share with the crowd. Jenny - There were 25 desserts, what was the best part about getting to taste all those yummies, and the most difficult? Kirsten - The worst part was that each dish was so delicious. The best part was that I handed my leftovers to Mandy to save for later to eat at the bed-and-breakfast but the worst part again was that Mandy ate them all before we left the restaurant! Jenny - Any other thoughts you’d like to share? Kirsten - Look at what an amazing community event this was, even though it wasn’t the best berry year we’ve ever had. Imagine what it will be like next year. (I am already hoping for a better crop). Jenny - Would you consider coming back again, maybe bring your cookbooks and do some book signing and perhaps a cooking demo? Kirsten - Absolutely. Mandy and I are working on a new cookbook that will be out in the spring of 2019. We would love to share some of our new recipes and ideas – and, of course, learn from you as well. Join us for the 2018 event, Saturday, August 11, 2018 at the Boardwalk Hotel! All entries need to be registered at the hotel between 5:00 and 6:00pm. Judging will begin at 7:30pm!